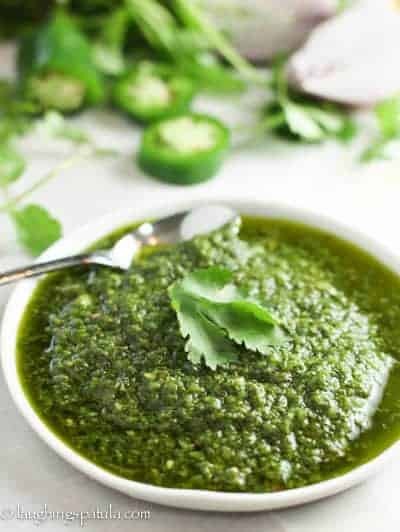 This super simple and healthy recipe for Chimichurri Sauce will quickly become your favorite condiment! Simply toss fresh ingredients into a blender or food processor and it’s done! Healthy and delicious ! Chim chiminy, chim chiminy, chim-chim-churri – this sauce is as tasty, as tasty can be! (if you didn’t see that coming – than you just don’t know me). Argentina for use on steak. But it does so much more! It is a healthy wonder condiment and marinade for fish and chicken. I first tried it at Sammy’s in Maui (Sammy Hager’s Airport diner). They used it as a salad dressing, it was thinned down with a bit more olive oil and it was delicious. So add salad dressing to it’s many uses as well! It packs a punch of flavor and takes only a few minutes to assemble. If you have the time, let it marinade over night for full flavor. Feel free to arrange the recipe to your liking. Don’t like cilantro? Use only parsley. (that would be me!). Too much garlic for you? Cut it in half. You can make this any way you want. There are many, many versions on-line but the basics are parsley, garlic, vinegar and olive oil. The oregano, jalapeño and lemon seem to be hit or miss. I like the spice of the jalapeño and the lemon helps keep that wonderful green color! We have over 100 healthy, fast and fresh recipes. You can see them all HERE! Two of our favorites are this 30 Minute Mediterranean Fish Skillet and this One Pan Roasted Lemon Chicken! Hoping you will be singing the Chimchurri song very soon! A easy to make, flavor packed marinade or condiment for beef, chicken or fish. Pulse parsley, cilantro, garlic, onion and jalapeño in a food processor until smooth. Add remaining ingredients and pulse until well combined. Store in sealed container in fridge for up to 2 weeks. Serve on chicken, fish and beef. I found this recipe on Pinterest and I was very surprised with some of the ingredients you use in yours. I’m also from Argentina and the choice of cilantro is a no, no for chimichurri. In Argentina we don’t even know what jalapeños are. I don’t doubt that maybe for the American taste it’ll work really well, but please don’t call it chimichurri. 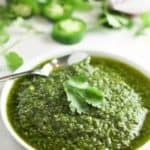 Argentine chimichurri is made with parsley and lots of ground red pepper with seeds included. Maybe you should clarify that it’s a Mexican style version. Thanks! i’ve been searching the net for a version of chimichurri that has lots of parsley, cilantrro, garlic, and includes a jalapeno as lagniappe. whether it’s authentic Argentine or not, i don’t really care, as long as it has my preferred ingredients. i’m not married to a traditional recipe, coming from an Ashkenazi jewish food background, so i’m flexible with my food. Hi Hollis – I hope you get a chance to give it a try…I’d be curious what you think! I really love it and have had ‘authentic’ chimichurri. This is very similar but has a kick! Growing up my parents used to eat a local cuban place and this was my favorite condiment for the steak and rice and anything else I could dip in it. I’m growing cilantro in my summer garden so I’m super thrilled to try this myself. Thanks for sharing. How do I subscribe to your blog? It’s really fun! Hi Shelley – there is a subscriber box on the front page but I sent you an invite. Just click and you will receive my recipes! Thanks so much! It’s amazing how recipe versions morf over time and sea. I am the first to admit I don’t know a good chim from a bad chim! But I love learning new tricks! Thanks for your note! I tried this recipe yesterday! It was terrific! I’m definitely going to make it again! Ok, now I have that song in my head. 🙂 I am definitely making a riff on this soon! I’m glad to know I’m not the only one who has that song in the back of her head when she makes chimichurri sauce. This looks so bright and full of flavor. 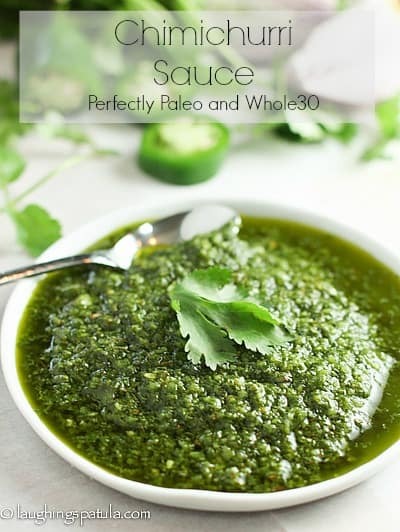 I’ve seen this sauce before but never had a recipe, so thanks for posting it! I think it’s a nice change from pesto, and I’m loving the idea of it on seafood. Pinned it! Holy cow this looks gorgeous Kathi! I am a *huge* cilantro fan, I don’t know why I’ve never made this before. I am going to have to change that ASAP! Your photography is beautiful. Love your site – I’ve been stalking it for some time and thought I should say hi! Thanks for the compliments!